I want to share this story from Love in the Land of Dementia, a tribute to my mother and her beautiful capacity for wisdom. Here’s to embracing the divine flow of life. For the first time, my mother cannot really help prepare our Seder meal. She wanders around the kitchen, pausing at the counter, the stove, the table as if to collect something lost. “What was I doing?” she asks. “Setting the table,” I say. “Ten,” I say, spilling the spoonful of oil in my irritation. 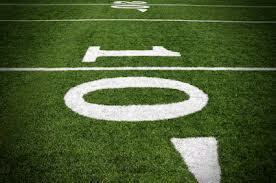 An old football cheer floats into my mind, “First and ten, do it again. Do it again.” And again. Mom has already asked me these questions several times in the last 10 minutes. When Mom and Dad drove up two days ago, Dad’s face was tight and he went straight to the guestroom to take a nap. “Sometimes I wish I were hard of hearing,” he told me, later that evening. Mom’s speech is like an old record player with a needle that refuses to leave its groove. The simple anchors of life, the who, what, where, and when of things, often elude her. “Did you remember the macaroons for dessert?” she asks, a fork in hand. “Yes,” I say, again. I crack an egg and have to scoop shell out of the bowl. I stir the matzo mixture and take a breath. I have trained myself to be brisk and efficient, but now, around my mother, I need to be slow and soft. “How many people are coming?” she asks. I wipe my hands and look for the house keys. They are not on their usual hook in the cabinet. They are not in my purse, or lolling on the kitchen table. I feel a brief flutter of shame over the impatience I felt just this morning, when Mom misplaced her glasses case for the second time. Then I feel a stab of fear: am I too losing my mind? “Have you seen my keys?” I ask my daughter, who comes breezing through, searching for chocolate to inspire her mid-term studying. She stops, Hershey’s bar in hand. “They’re right in front of you, Mom,” she says, pointing to a huddled mass of metal on the counter corner. 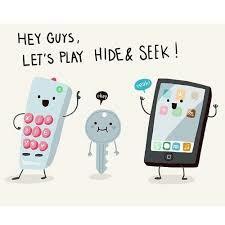 I pocket the keys and double check to make sure I have turned off the stove. Outside, the redbuds are flowering; the dogwoods skirting newly green lawns. My mother and I walk past a closed-down lemonade stand, three broken lawn chairs,set out on the curb, and a blond, floppy-haired girl, skipping over a pink jump rope. I nod. I remember as much about my mother’s childhood as I do my own. The story of her mother’s death is one in a series of memories Mom has told me all my life. We pass a woman strolling a sleeping baby and Mom smiles. “What’s it like to not remember?” I ask. An eager black spaniel rushes up to us. 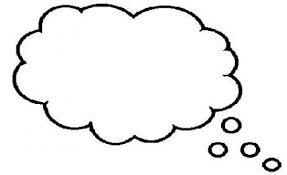 “I start a thought,” Mom says, bending to pat the dog, “and the end disappears. If I try too hard to catch it, that makes it worse. So I let go, and eventually I get the answer. Of course, by that time, something else is going on.” Mom smiles and shakes her head. Her hair is silvery and curly; her hands like fine dried flowers; her stride crisp and full. All weekend, I have watched her happily listen to the conversations around her, passionately asking a question, then moments later, equally passionate, asking the same question. I have listened to her stories, which have the comforting familiarity of a well-worn quilt. These stories, which sprinkled my growing-up years, are now the major part of our conversations. And so we follow the journey of our ancestors, promising we will be satisfied. With whatever we get. As I repeat my gratitude and pledge my satisfaction with life as it is I think of my mother. I miss her remembering all the details of my life. I miss her knowing where the silverware drawer is. I miss telling her something I’m proud of and having her remember it. And yet, she is the living symbol of Dayenu, graciously accepting her failing mind and making the best of it. “And now, it’s time to eat,” my father says. My mother reaches over and pats my wrist. I see the patina of softness that burnishes her, the loving core that goes far beyond mundane daily detail. I see the woman who has loved me even during the years I wandered through a difficult wilderness. If my mother gets pleasure out of life. . . If she remembers who I am. 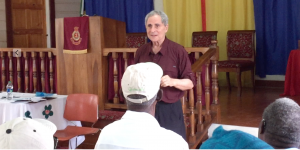 . .
Our hosts started the program with a beautiful hymn of gratitude, a perfect way to acknowledge the spiritual aspects of connecting and laughing in the land of dementia. 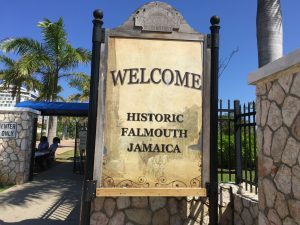 We met in the Salvation Army Church and Community Centre in historic downtown Falmouth, Jamaica, with a group of caregivers and community advocates. 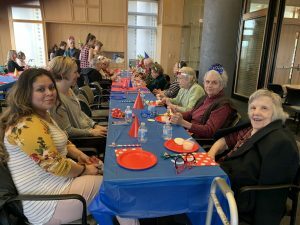 During our time together, we shared stories, information, laughter exercises, and creative ideas for taking care of ourselves and staying engaged. For many, this was an introduction to dementia. 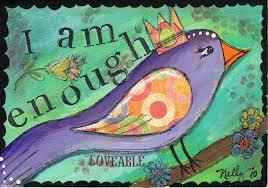 For others, who were in the midst of caregiving, this was a time of learning and sharing. Ron and I talked about the importance of accepting each other as we are, no matter what we are going through. 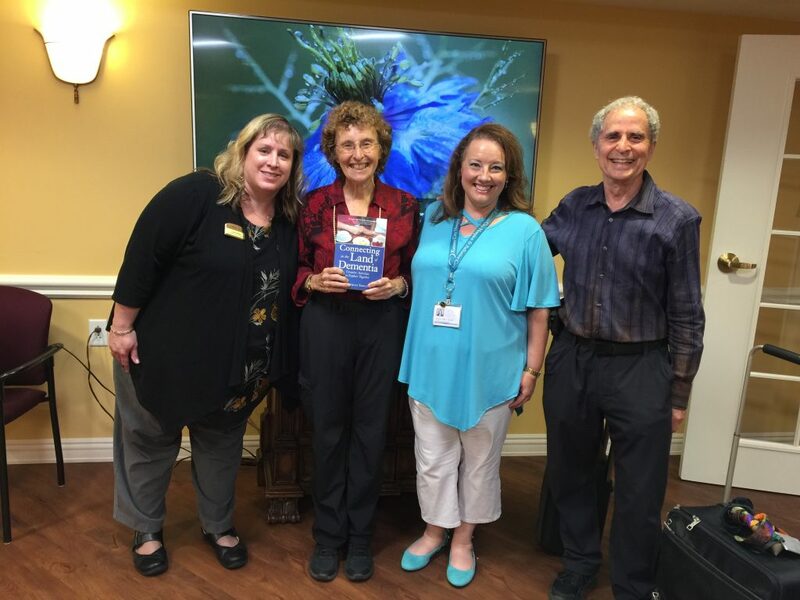 We discussed the power of having a purpose and how vital it is for all of us to have meaningful relationships and interesting experiences. .
“When we are kind to ourselves, then we are better able to be kind to others,” one of our attendees said. We discussed Dr. Cameron Camp’s concept of cognitive ramps, offering people the assistance they need to remain engaged in the activities they love. Here’s one example from our session: Lorna’s mother was a professional cook, completely at home in the kitchen. As her dementia progressed, she could no longer remember the family’s favorite recipes. But she could sit in the kitchen and enjoy the energy of cooking. And when Lorna’s daughter said, “We are going to make your famous stew. Does it have an onion in it?” the mother smiled and nodded. Ingredient by ingredient, they consulted her, and she smiled and nodded at the mention of the right ingredients. Even though she wasn’t physically creating the meal, she was an integral part of the process. We talked about the power of music, sharing ideas from Dan Cohen’s Music and Memory program and introduced people to the personal playlist. We had an impromptu Conductorcise session, using Maestro David Dworkin’s aerobic and ground-breaking program, pretending we were conducting a symphony orchestra. We used laughter syllables to make it even more fun and soon everyone was standing up and conducting and laughing. 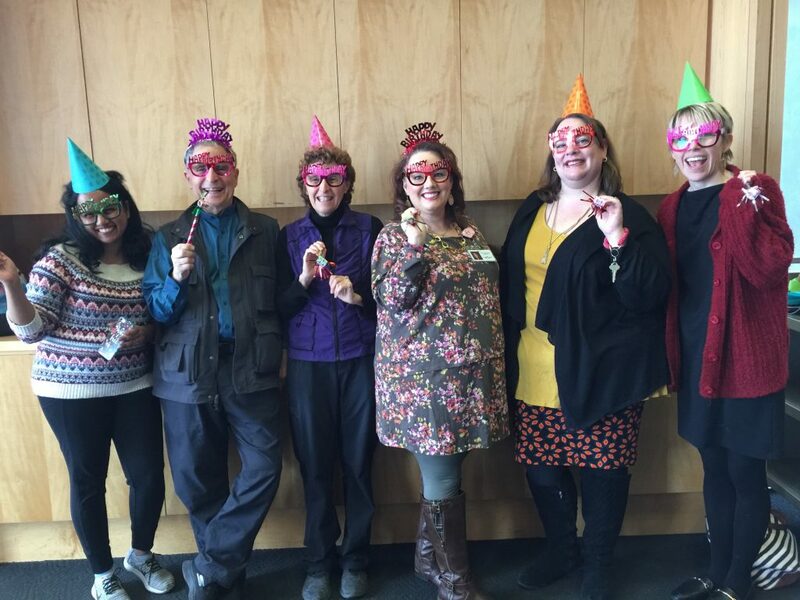 We shared a story from Karen Stobbe, reminding us all to affirm and appreciate and to use the improv technique, “Yes and…” to ignite and invite conversation. Throughout our discussion, we wove in laughter exercises. We enjoyed an imaginary laughter swim. 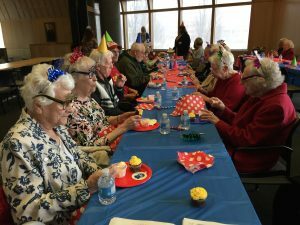 We batted around laughter balloons and cooked up a laughter stew that included fish, pumpkin, garlic, carrots, Irish potatoes and okra. At the end, we breathed in our gratitudes, closed our eyes and sent our feelings of love, connection, and laughter into the world, hopefully to help and inspire others. A special thanks for the dementia advocates and community volunteers who brought everything together, including Dundeen Ferguson, Shirley Duncan, Sandra Latibeaudiere, Elise Thomas, and Lorna Colley. And thanks to everyone who attended. The people of St. Thomas have been through a lot and many are still recovering from Hurricane Maria. But despite the hardships, they were ready to laugh for health and happiness. 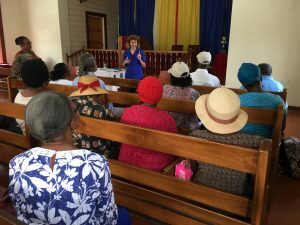 We were delighted to be working with our friend Arleen Evans O’Reilly, Director of the Family Caregiver Support Program, offering a laughter yoga class in St. Thomas. 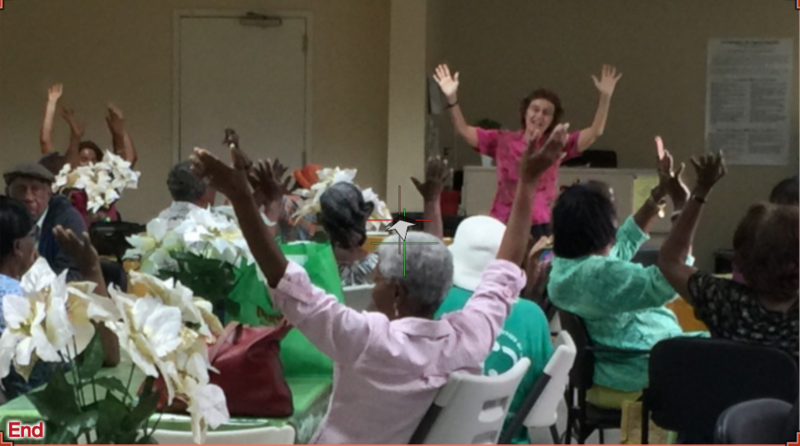 We met at the senior center and had a wonderful time facilitating laughter with seniors, caregivers, and people who are living with dementia. CLICK HERE to experience a glimpse of our session. We have been experimenting with making our laughter sessions increasingly interactive. We invited our attendees to suggest ingredients for the stew and it included chicken, pumpkin, onions, carrots, potatoes, and bullion. After we added and stirred, we tasted and it was both delicious and “funny” tasting. For our milkshake, we first asked people what ice cream they want to use. We had a lot of chocolate lovers. A few enjoyed vanilla and strawberry. We also had fans of praline cream, banana, and cherry Garcia. We held an imaginary container in one hand and we poured milk with the other hand and and said, “Ha ha ha.” After doing that three times, we scooped in our ice cream three times, adding in laughter syllables. Then, with both hands, we shook and laughed. Finally, we tasted and enjoyed a good giggle. Ron and I continue to explore ways to add more laughter into our every day lives. The benefits of sustained intentional laughter include reducing stress, lowering blood pressure, boosting the immune system, increasing oxygen to the brain, creating a sense of connection and community, and increasing feelings of happiness. Plus, laughter offers us aerobic exercise. Laughing while we exercise. Squats are much more fun when you’re giggling as you do them. Adding laughter activities in while we walk. Singing “Ha Ha” syllables to favorite tunes. Even a simple, Row Row Row Your Boat, with Ha ha syllables, makes us laugh. We often visit Robert Rivest’s site for short ten-minute laughter videos, which cheer us onward. Laughteryoga.org offers more great resources. And we have fun creating our own laughter activities. If you have laughing ideas you want to share, we’d love to hear from you. I saw the red outfit and overgrown white beard even before I heard the bell ringing. I reached into my pocket to dig out a few coins. This Sunday Santa looked surprisingly like a Norman Rockwell version. Then I noticed there was a glint rather than a twinkle in his blue eyes. “I’m asking you to give back!” His voice was deep, but I didn’t hear the old jolliness. “Well, yes, I have,” I said, remembering the red bicycle that had magically appeared when I was seven. “Yes, I do.” I rubbed my hands together. The wind was sharp and my fingers felt frozen. “I really need to get going,” I said. I looked at Santa carefully and wondered if whoever hired him knew he was over the edge. I breathed in, but detected no odor of alcohol. His pupils were not dilated; his hands not frenetic. He didn’t look like he was on some mind-altering substance. I reached into my wallet for a dollar or two. Part of my brain was sternly reminding me this was an ordinary man dressed in a fluffy red suit. Then, a wave of compassion pushed through me. Here was a great mythological hero asking for help! 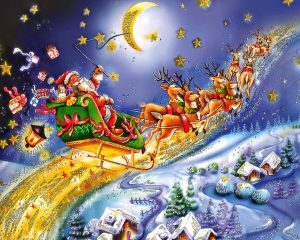 Santa’s legs seemed to buckle and he sagged as though he were about to fall. I took his arm and led him into a nearby fast food place, where I bought him coffee and fries and a big burger with everything. As he ate, I pulled out my cell phone. “I’m going to be a few minutes late,” I told my shop manager. “That’s just one of the things we need,” Santa said mournfully, as I finished my call. I pictured Santa, sitting in his reindeer-driven sleigh, dialing direct and collect. I wondered how many would take the call. My throat tightened. I imagined Santa, logging in on line, charging up presents on his gold credit card, filling out W-2’s on the elves and writing up reports for OSHA and the SPCA about the reindeer. I imagined a virtual holiday, where presents simply appeared as part of an email attachment, recipients unspecified. 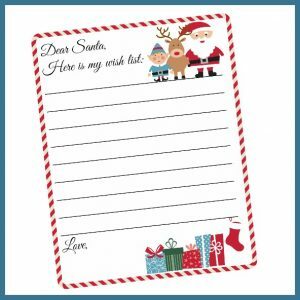 I handed Santa a pen and a page from my note pad. As he wrote, I stared out the window, watching shoppers rush past. Most of them looked anxious and overwhelmed. They would be even more anxious if they knew Santa was considering taking a Christmas off! Before I could refuse, Santa had settled at least half of himself on my lap. “So what would you like for Christmas?” I said, in my deepest, merriest voice. “A cell phone, with unlimited long distance. A new transportation system. Something that doesn’t leave hoof prints. Productivity training for the elves. Sensitivity training for the reindeer. A new suit, something with pockets. A new corporate headquarters — in a more temperate climate. Santa bounced up and down as he recited his list. Each bounce made my legs twinge. Each word made my heart cringe. If Santa traded his charm, and his bumbling good will for high tech efficiency, the whole spirit of the holiday season would be radically changed. “Now what?” I asked, when Santa had finished his list.. I raced to work, feeling great. I had just given to one of the world’s champion givers. As I walked down the crowded street, I looked carefully at each rushing person, wondering who else was in need of a little good cheer. 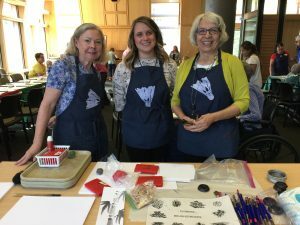 September’s Memory Cafe featured a lively team of educators from the Nelson-Atkins Museum of Art. Using the arts to draw us together, they showed us the Chinese art form of painting pictures of bamboo. About fifty of us gathered in the the library’s spacious lower level. Colorful plastic cloths covered our tables, making it easy to distinguish our drawing paper and painting supplies. All of us eagerly dipped our special bamboo brushes into the ebony paint and made short pushing movements, replicating segments of the plant’s stalk. Then our educators showed us drawings of bamboo foliage and we experimented with wispy thin lines of leaves. You can enjoy the energy of this event by clicking here to see our short video. 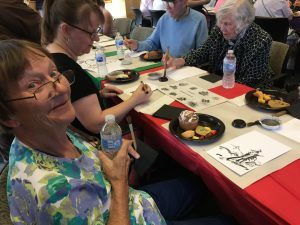 Of course, all artists need nourishment and we had wonderful treats courtesy of Kansas City Medicine Partners, Kingswood, Partners in Primary Care, and Morningside Place. 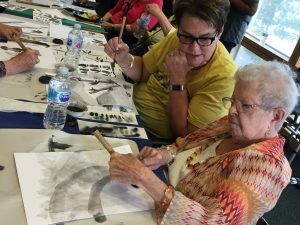 Want to explore using arts to draw you together? 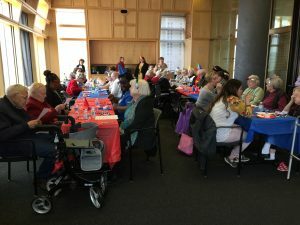 Here are some tips fromConnecting in the Land of Dementia, inspired by Berna Huebner, co-director of the documentary, I Remember Better When I Paint. • Try different types of art in different venues to see what resonates with your partner. • To add extra meaning, connect the artistic activity with something in your partner’s past. 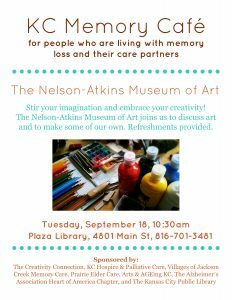 • Invite an intergenerational mixture of artists, from children, grandchildren, art students, and volunteers to join your partner and add encouragement. 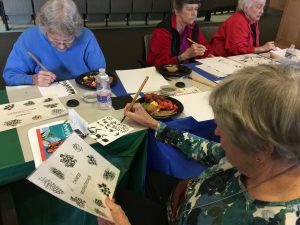 • Create a variety of art-related activities, including visiting galleries or looking at pictures from magazines, as well as painting, drawing or various media. The table was spread with an array of Czech delicacies: apple strudel, special sandwiches with flowers of ham atop fresh baguettes, a bountiful tray of strawberries, grapes, and apple slices. 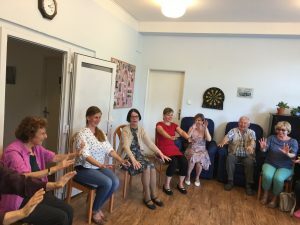 “This is the way we welcome people here in Prague,” said Lucie Hajkova, social worker and coordinator of respite care for the Czech Alzheimer’s Society. 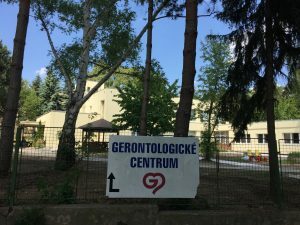 Ron and I were visiting the Gerontological Centre and the Czech Alzheimer’s Society, which are both housed in the same building. 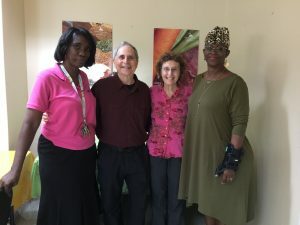 The two organizations work together to offer clients everything they need, from psychological counseling, to memory testing, to social work services, to healthcare. We came to learn and to present a laughter yoga session. We gathered with staff members around the table to learn about the center, which was started in 1997 by Iva Holmerova, MD. along with Hana Janeckova, PhD. Hana was putting together training materials for caregivers when she was contacted by Alzheimer’s Disease International. 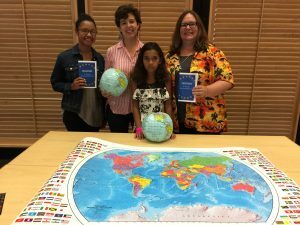 They wanted to know more about her work and they invited her to an international conference in Jerusalem. That conference was a turning point. Hana left it inspired and determined to help Czech families that were dealing with dementia. 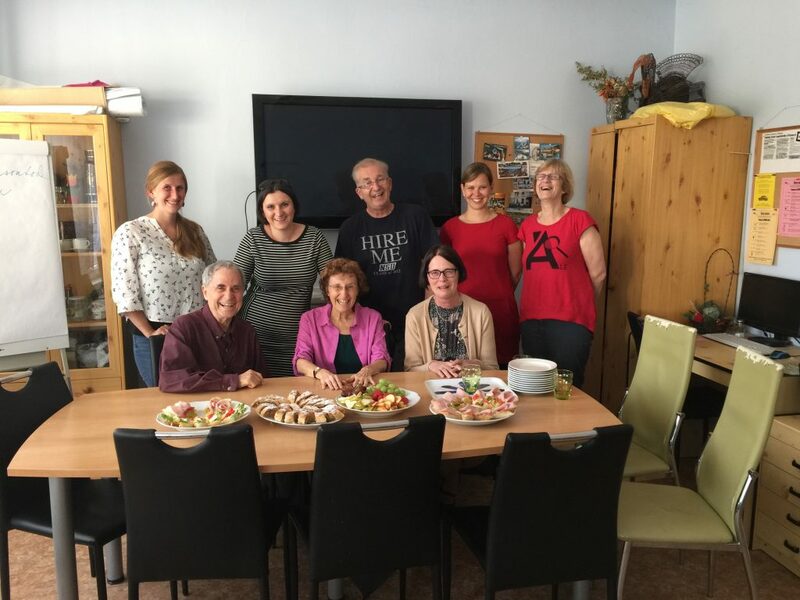 She contacted Iva and both saw the need to offer education, diagnosis, support, and care for people living with dementia and their families in the Czech Republic. Today, both centers are flourishing. Even more impressive than the Society’s services were its staff. Each had a passion for this work, a love for those who are living with dementia, and a compassion for their families. 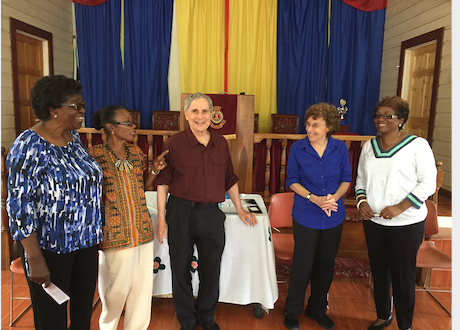 We had a wonderful time sharing a laughing session at the day center—our first international facilitation. 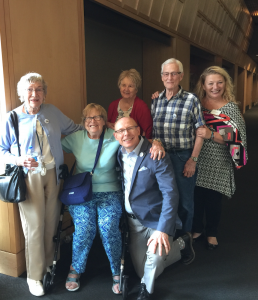 We sat in a beautiful circle of people living with dementia, staff, family, and friends. We couldn’t have done it without our translator, Eliska, who captured the energy and essence of what we were saying. And once we all started laughing, we were beyond the constraints of language. Click here to experience a bit of laughter in Prague. Lucie Hajkova, social worker, coordinator of respite care in homes of people with dementia. “I’ve traveled the world. 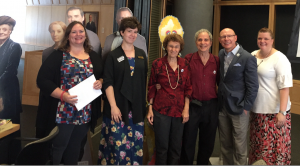 Our family moved a lot when we were young,” one of our guests told us, at our August Movies and Memories program. 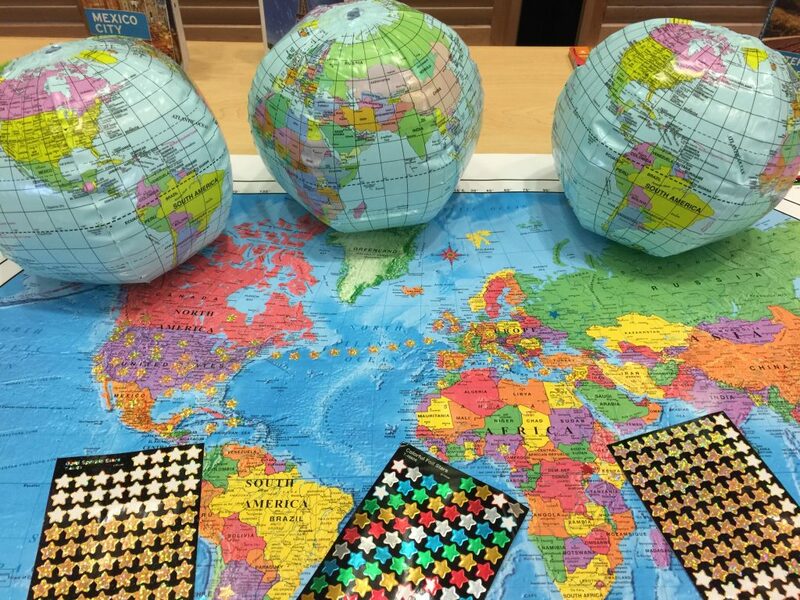 She and her husband bent over our world map and stuck stars on some of the many places they’d lived. Another guest sighed when he looked at the map and saw Vietnam. He had served in the military there. A couple talked about living in Berlin when the Wall came down. Our Movies and Memories travel films included forays into Paris, Iceland, Capetown, and Seoul. “It was relaxing just watching the scenes from Paris,” said Ah’Lee Robinson, director of the Kansas City Boys and Girls Choirs. He and his singers treated us to an inspiring concert, warming us up for the films. “Oh dear, now I want to go to Iceland,” another guest said. In between clips, we passed around exotic spices for everyone to smell. 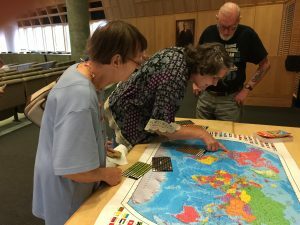 At the end of the movies and memories adventure, everyone took home a special “Passport” booklet, created by the library’s Emily Cox, so they could record impressions and memories. To experience the event, click here. What is one of the most beautiful places you’ve ever visited? What’s the farthest you’ve ever traveled? What country has the best food? How many of the US states have you visited? 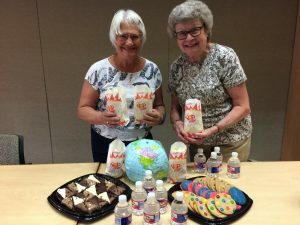 Thanks to our wonderful volunteers, Sharon and Julie, who brighten our events by bringing treats, making popcorn, and making everyone feel so at home. Thanks to Craig Eichelman, State Director, AARP, for helping us spread the word about this program. We are so grateful for the continuing support from the Kansas City Public Library. They are amazing champions for people who are living with dementia and their care partners. They also provide scholarships for hard-working people whose higher education has been interrupted by life circumstances. Their community programs benefit early readers, job seekers, and people who are new to KC. Ron and I use their books and other services every week! 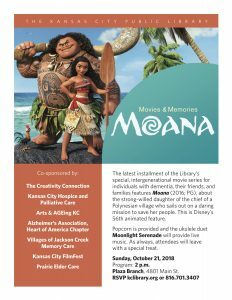 Please join us for our next adventure — Moana. This movie is so inspiring and great for all ages. When care partners gather and trade stories and ideas, there’s usually magic afoot. We felt that magic when we met with a group of family and professional care partners to celebrate great connectors throughout the dementia journey. We presented engaging ideas using music, nature, laughter and more. 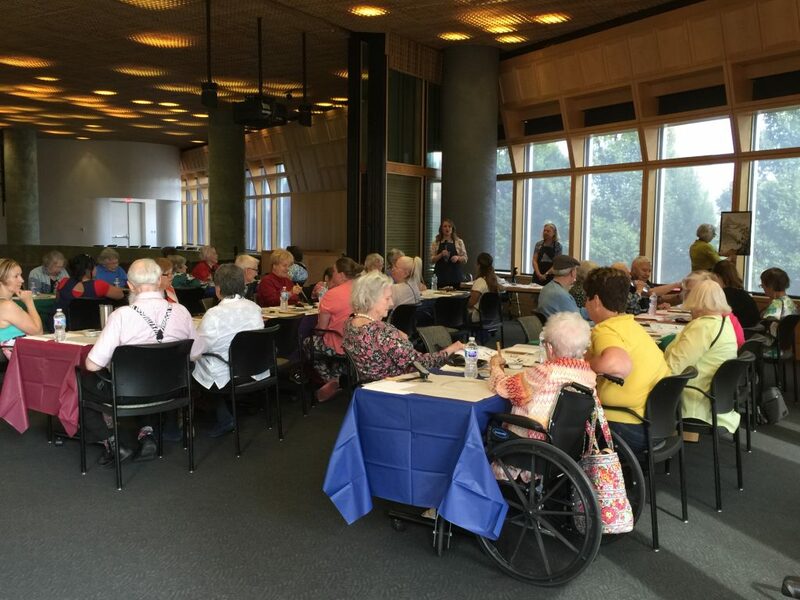 Lisa Vetter, Director of Healthcare Sales & Marketing, Santa Marta Senior Living Community, invited us to speak at an event announcing the community’s new care partner support group. The group is led by Jennifer Walker, RN, BSN, Clinical Community Liaison, Kansas City Hospice & Palliative Care. Jennifer also facilitates the KC Memory Cafe and she is compassionate, informed, and smart. Most importantly, she has a fantastic sense of humor. Ron and I shared ways to stay connected through singing and music, looking at works of art together, bringing nature indoors, and laughing. And our audience shared their experiences as well. Here’s a story about nature that inspired us. Marcie took her mom, who was living with dementia, on a fascinating monthly outing: they drove out into the country to look at the full moon. Her mother didn’t talk much anymore, but she loved seeing the night sky and gazing at the magnificent moon. One evening, as the moonlight spread over the car, Mom began singing, When the moon comes over the mountain. Marcie had never heard the song before and her eyes filled with tears at hearing her mom sing so strongly and clearly. Here’s a story about the power of familiar music. 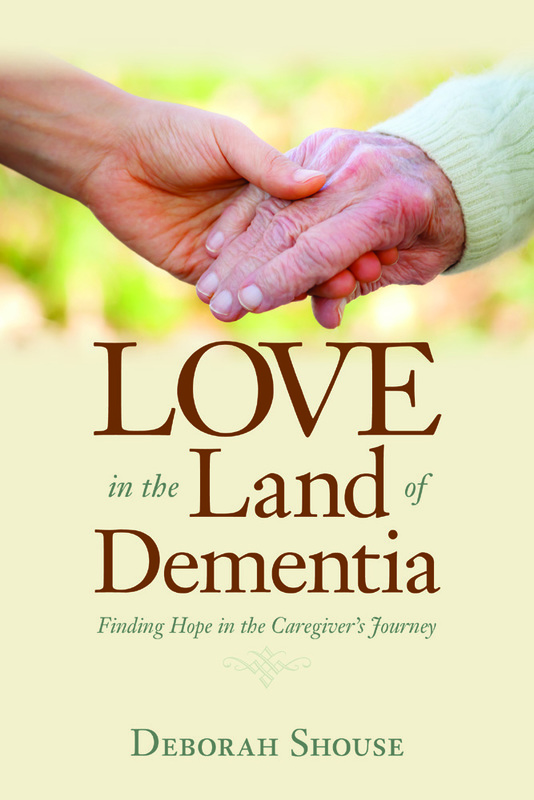 Karen’s mom was a devout Catholic, living with dementia. Though there were many things she didn’t remember, including her daughter’s name, when she attended Sunday mass, she melodically sang every word of every hymn. We loved sharing with this group of dedicated and compassionate care partners, who were all seeking ways to stay connected. Here’s an extra tip from Connecting in the Land of Dementia: When you want to boost energy and lift spirits, add a splash of laughter into your life. Look at a clock and say, “We’re going to laugh for 30 seconds,” and start ha ha ha-ing. Or pretend you’re talking on the phone and hearing a hilarious joke. Or warble out the Ha Ha Chorus by singing the Happy Birthday song in “ha ha ha” syllables. How has television shaped our lives? 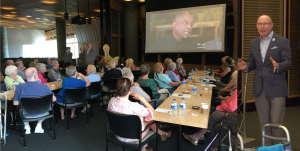 Nick Haines, Executive Producer Public Affairs/News, at KCPT, helped us count the ways at our August Memory Cafe. 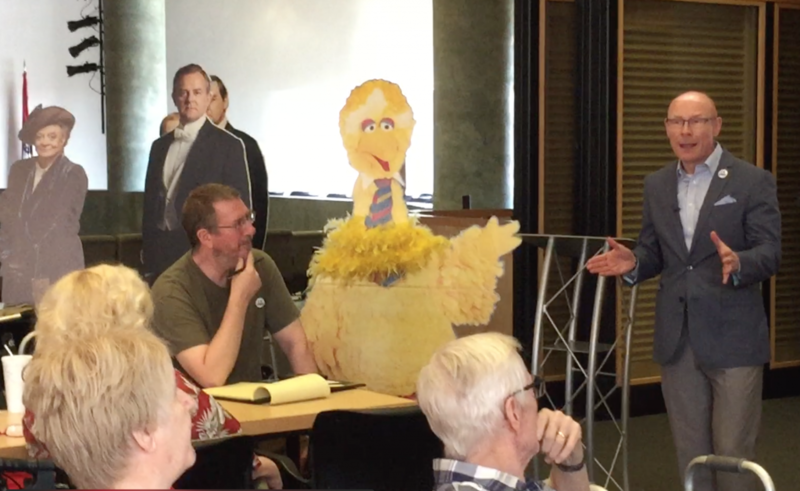 Fifty people joined us for this witty and illuminating program, including some PBS favorites: Big Bird and the stars of Downton Abbey. Nick began by showing us a few of the 20 most iconic TV clips of our time, including the space landing, Johnny Carson’s farewell show, and the tragedy of 9-11. Then we moved onto commercials. Does anybody remember when people dressed up to get on an airplane and domestic flights served hot food on real china dishes? How about a young Donald Trump starring in a Burger King commercial? The cafe crowed went crazy over a white-coated MD, starting that he and his colleagues preferred Camel cigarettes. Nick had us guess the two most popular non-sports TV events. (Mash and Roots.) And he set us laughing with tag lines from various products, such as M&M’s, Frosted Flakes, and Alka Seltzer. Nowadays, people watch on so many venues and are often not conversant with the same shows. 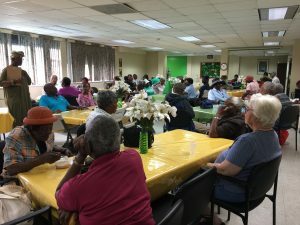 But during our cafe, we were all tuned into the enjoyment of sharing laughter, memories, and ideas. Thanks to Nick for his great talk and to KCPT for all the marvelous programming and community work they do. And thanks to all our teammates and community volunteers. KCPT is one of the Kansas City Public Library’s many partners in programming. Our library is an amazing champion for people who are living with dementia and their care partners. They also provide scholarships for hard-working people whose higher education has been interrupted by life circumstances. Their programs benefit early readers, job seekers, and people who are new to KC. Ron and I use their books and other services every week! You don’t need to be artistically inclined to enjoy our next cafe on September 21st. We hope you can join us.